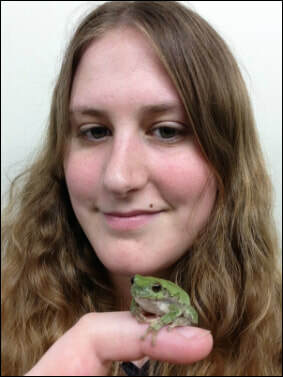 I'm currently an NSF Post-Doctoral Research Fellow in Biology at the Centre for Evolutionary Biology, University of Western Australia. My research in Dr. Leigh Simmons' lab examines the evolution of sexual traits by pre- and post-copulatory selection. I work primarily on the evolution of genital traits in rodents. I completed my doctoral work with Drs. Mark Bee and Marlene Zuk at the University of Minnesota, where I was an NSF Graduate Research Fellow and Ford Foundation Pre-Doctoral Fellow. My dissertation research primarily focused on constraints on the evolution of acoustic signals by sexual selection. I used both vertebrate and invertebrate systems to answer questions about how multivariate sexual signals are shaped by mate choice, how biotic noise affects the expression of female mating preferences, the capacity of within-individual variation to mask the between-individual variation that is the target of mate choice, and the role of behavior in the establishment of novel phenotypes.